Seth Lugo has been moved back to the bullpen, according to manager Mickey Callaway. For those owners who picked up Lugo for his two-start week, this is an obviously unfortunate development. With the Mets having only five games next week, the need for a fifth starter is obviated. Lugo should at least provide quality innings out of the bullpen. 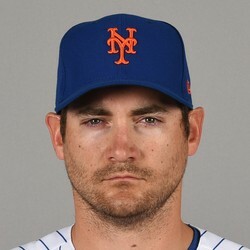 Seth Lugo allowed three runs (one earned) on four hits with three walks and four strikeouts over five innings Monday against the Pirates. It was a so-so effort from Lugo, and certainly an improvement on his previous two outings. He was helped by two of the three runs he allowed being unearned, and he avoided damage despite the seven baserunners in five innings. His ERA and WHIP of the season are 2.76 and 1.07, but he hasn't been that productive as a starter. Seth Lugo allowed six runs (three earned) on six hits with two walks and five strikeouts over three innings against the Rockies Wednesday. Lugo should get a pass considering the park he was pitching in. It wasn't a good day for the former reliever, but his last start in Arizona was more concerning given the park and competition. Owners can look to the start before that against the Yankees to see Lugo's potential, but he's hard to trust coming off these two lackluster appearances. Seth Lugo allowed five runs on eight hits and a walk over five innings in Friday's loss to the Diamondbacks. He struck out seven. Lugo allowed two home runs and was just far more hittable than he had been in his last start against the Yankees. The seven strikeouts showed that he still has the upside to be worthy of a starting spot in a fantasy rotation so long as he holds one for the Mets, which he should continue to do in the near future with Noah Syndergaard's return date looking uncertain. But with his next outing lined up in Coors Field, owners may want to take a pass anyway.